The smoke was so thick in Whitehorse last weekend that you couldn’t see the mountains. Dawson wasn’t much better. In fact, there are 32 forest fires burning right now…the result of a long dry hot summer….and there are countless more fires in Alaska too. Consequently, it made for very tough riding. I had to stop every half hour just to catch my breath. It was like riding with a cigarette in my mouth. As Joel Plaskett would say, « smoke so thick you need a lighthouse ». The first day I hit the wall at only 44k. The second wasn’t much better. By the third day, I knew I was in trouble. My throat hurt, nose wouldn’t stop running and my lungs felt heavy like a brick. In planning for this trip, I thought I had considered everything….good tires, good bike, raingear etc… But I never even considered forest fires. I talked to a group of tourists coming from Inuvik and they said there was smoke all the way to Fort MacPherson. There was also a new fire burning north of Eagle Plains on the Bell River. So by the three day mark and at the rate I was going, I realized that I wasn’t going to make Eagle Plains before my food ran out. I even thought about hitching a ride but the traffic was light and mostly tourist campers. So I had to come up with a plan B. The trip then turned into a ride out and a ride back….less than what I wanted but the only reasonable compromise. This also allowed me the opportunity to explore a few sites along the way. 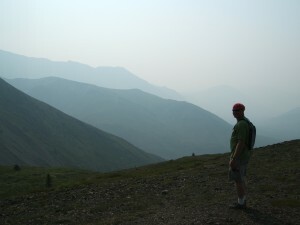 There were some highlights….hiking in the Tombstones, swimming in the north Klondike River, sharing coffee in the clouds at the Continental Divide with fellow rider Mary England (with younger lungs and more time, she was heading to Inuvik) and eating handful of small but sweet blueberries. 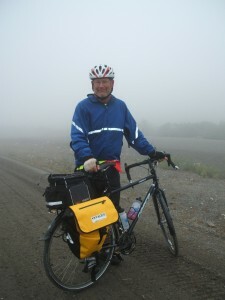 I got to spend 7 days unsupported on my bicycle. I climbed 3000 feet to the Continental divide and enjoyed the long ride back down. Met a few cool folks along the way too. I am disappointed after all that planning but Plan B was a whole lot of fun too. Also, a trip to Dawson….nothing is better than Dawson City in the summer. A humbling experience all the same. A little disappointed but sometimes, even with the best planning, we need to be adaptable. As my friend from Idaho says….time to throw your disappointment in the ditch and celebrate your achievements. I also was able to raise $2500 for Cancer Research, build awareness for Cameron Helps and the Three Rivers Project. So…turning 50 has been pretty darn good! Wait ’till you see what I will come up with for the 60th! It rained yesterday for the first time in three weeks. The skies are clear blue today…go figure.